This guide shows you the most basic approach to create MSI installer. Either watch our video or read the step-by-step guide below. 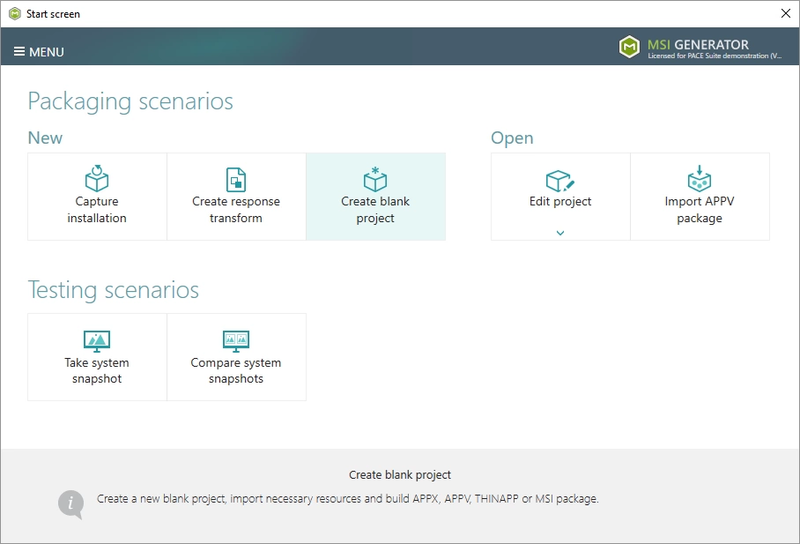 Creating a blank MSI package in MSI Editor and managing not only files, registry, and shortcuts, but also services, permissions, custom actions – any setting the package can have. Creating a project that is limited to adding the most basic resources: files, registry, shortcuts. The latter is the easiest approach and we will review it in this guide. You can find more advanced approaches on our website. 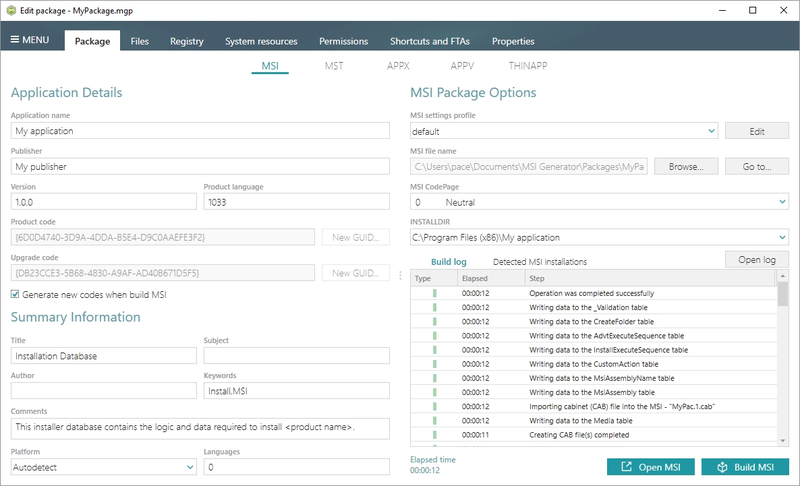 Get your free PACE Suite trial to create MSI package as we show in this guide. Launch MSI Generator, part of PACE Suite, and click Create blank project. Enter a project name and click Create. Add necessary resources (like files, registry, shortcuts, etc.) to your project file, which later will be saved to your package. On the Files Tab, resources from the ‘Files Included’ pane will be saved to your package, and resources from the ‘Files Excluded’ will not be a part of the package, it will be kept as excluded ones only in the project. Note that you can include or exclude necessary resources at any time. To exclude unnecessary resources from the project, select Exclude from the context menu of an item, which is located in the left ‘Files Included’ pane, you want to exclude from the project. To include necessary resources, previously excluded from the project, select Include from the context menu of an item, which is located in the right ‘Files Excluded’ pane, you want to include back to the project. To add Custom Folder, select New folder from the context menu of a parent folder, to which you want to add a new custom folder. Enter a folder name and click Create. To import Files, select Import files (or Import folder with files) from the context menu of a parent folder, to which you want to import files. 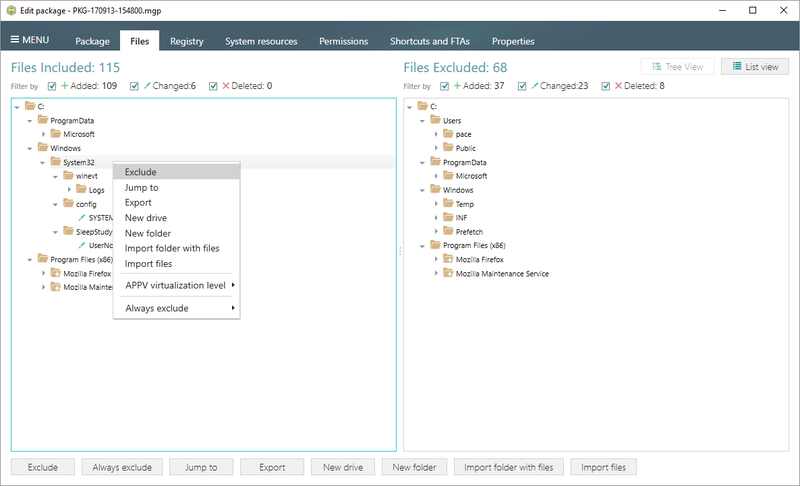 Choose files from your file system you want to import and click Open. To exclude unnecessary resources from the project, open the Registry tab and select Exclude from the context menu of an item, which is located in the left ‘Registry Included’ pane, you want to exclude from the project. To include necessary resources, previously excluded from the project, select Include from the context menu of an item, which is located in the right ‘Registry Excluded’ pane, you want to include back to the project. 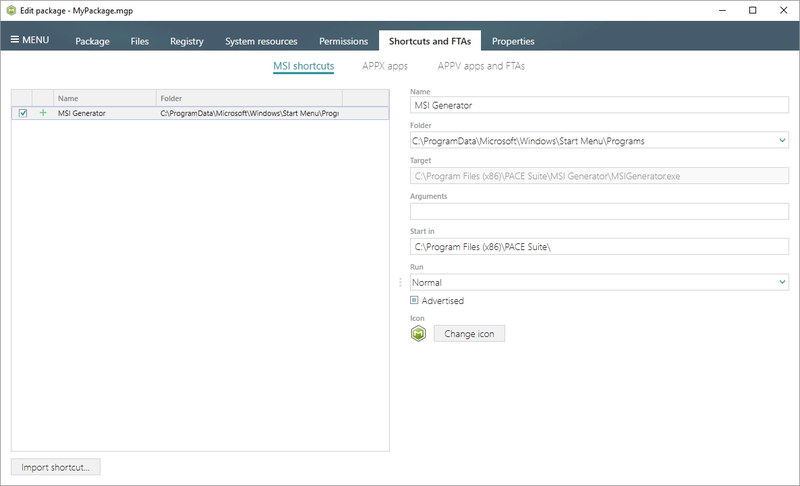 To import Registry, select the Import registry from the context menu to import registry entries from a REG file to the project. Choose a REG file from your file system, content of which you want to import to the project and click Open. 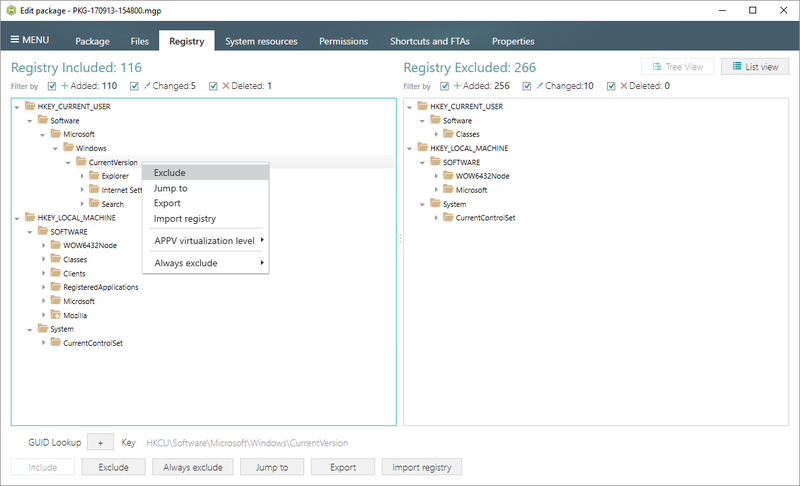 To export Registry, select Export from the context menu of a registry entry, which you want to export to the REG file. Specify a name and a destination location of the REG file and click Save. To import Shortcuts, open the Shortcuts and FTAs and Shortcuts tab. Click Import shortcut. Select a folder, to which you want to import shortcuts (e.g. ‘C:\ProgramData\Microsoft\Windows\Start Menu\Programs’) and click Ok. Choose an LNK shortcut, which you want to import from your file system and click Open. In order to create MSI package from your project, navigate to the Package -> MSI tab, update Application Details like name, publisher, version and click Build MSI. Click Go to…, located next to the MSI file name field, to open the package containing folder in Windows Explorer. Recently, we have greatly enhanced the speed of creating MSI packages – even very large packages can be generated in short periods of time. After packaging, you will be able to find your MSI installer in the project folder – the path to it is specified in the MSI file name field. Your MSI package will be ready for deployment. In this folder, you can also find the project file and its resources. You can open the project at any time, update the resources and generate another version of your package.